You wouldn’t have needed a crystal ball to predict this one, the inevitable has occurred and David Moyes has been given the sack three games from the end of the season. Whether you agree or disagree with the decision it cannot come as a surprise to the majority of football fans, even more than that, it couldn’t have been much of a shock to the entire world! Everyone seemed to know of the Scott’s troubles. There has been much made of his unwanted records, lowest points tally in the clubs premier league history, worst league home form ever, first time lost three in a row since 2001 and many, many more. With all of this in mind here are some of the key failings I feel are responsible for the poor season. First of all we start with the team. The team Moyes inherited were not premier league contenders. Yes they had won it the previous season but that was largely down to teams around them missing opportunities. Sir Alex Ferguson is one of the best managers the world has ever seen and that played a big part in the teams win. After what seems like an eternity in football Ferguson has forgotten more than the normal man knows about the sport. In short Manchester United won the worst season in premier league history because they were slightly less worse than the rest. It was no secret that a major rebuilding was needed at the club in the wake of Ferguson leaving and this job was left in the hands of Moyes. This is where Moyes was got his job fundamentally wrong. The club needed to be rebuilt from the bottom up they did not need to buy a few players to try and cover the obvious cracks. Manchester United’s relic of a defensive line up is where the manager needed to start. Ferdinand, Vidic and Evra have all been great servants to the club and a big reason for the recent success of the club is them but, they are now too old. This year we’ve seen players in the twilight of their careers having the seasons of their lives, having a huge impact on the league, United’s golden oldies have had an impact on the league too, unfortunately a negative one. What do you give a man that has it all? These three have won all there is at United and it’s no secret that Vidic is moving on at the end of the year, Moyes had to have known this. The two centre backs have never been blessed with pace and are only getting slower, fresh blood is needed. There is the option of Phil Jones and Chris Smalling but in my humble opinion these are not two that could lead a Manchester United defence and this has been shown by Moyes rarely playing them. Manchester United’s defensive failures have been highlighted by Chelsea showing the importance of a solid defensive unit. More than this their manager has spent every waking moment telling anyone that will listen that their club isn’t ready. Even though his team are 90 minutes away from a champions league final and in with a big chance of winning the league he can fall back on what he has said all season ‘the team isn’t ready’. While up Manchester were the fans told what needed to happen to their team? No. United are winners and they are used to that and after winning the league last year they would have seen no reason for this to change. Moyes was picked by Ferguson to manage the team, if he had his backing then he had the fans backing but Moyes in my opinion has never done enough to engage with the fans. He isn’t known for being a charismatic leader, not many are but he could have done so much more to show the United fans he wanted the job and wanted to connect with the club. Even up until the very last game did Moyes ever say that this is what he wanted meaningfully? Did he ever at any point show the kind of fight and passion that the fans want to see? Did he ever seem to understand the club? 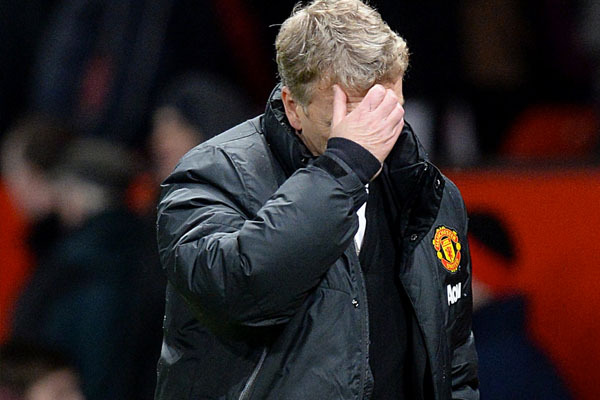 In continuation of the previous point, Moyes never seemed to grasp who Manchester United really are. If you look at Liverpool and Brendan Rodgers, with a droning monotone voice that could put the best of us to sleep he has won the heart of every single Liverpool fan, how? He understands them. Rodgers answers to questions about the Hillsborough tragedy showed this, he didn’t just give diplomatic, scripted answers he, with an air of class, spoke from the heart in a way that fans would want their manager to be. Yes winning helps, a lot, but last year wasn’t a winning one for Liverpool, they didn’t even make the Europa league positions but he did what Moyes didn’t and explained the necessity for the team to rebuild and that would mean a fall before a dramatic rise. It can be argued that almost every manager bar the world’s top few managers, Mourinho, Guardiola and co. would have failed. Alex Ferguson did everything there is to do in football and he did it for 26 years, an incredible feat that may never be repeated let alone topped. No matter who took over the job they were going to be compared to a record that is truly incomparable. This isn’t really a failing more a fact, whoever takes over from Moyes has an easy ride when compared to the mountainous task of taking over a living legend. David Moyes is a good manager and he will recover and learn from this experience. The job he did was more than commendable and this will no doubt mean he has no problems finding another job in management. Manchester United was just too big a step, he has the ability to lead a big team and I feel he will again but at this moment in time he just was not ready. This Post was posted in Football and tagged Football, Manchester United, Moyes, sacked. Bookmark the permalink.